Local Love / music / sacramento / Shows / Things to do / Word. Electric Christmas will once again kick off the holiday concert season in Sacramento. 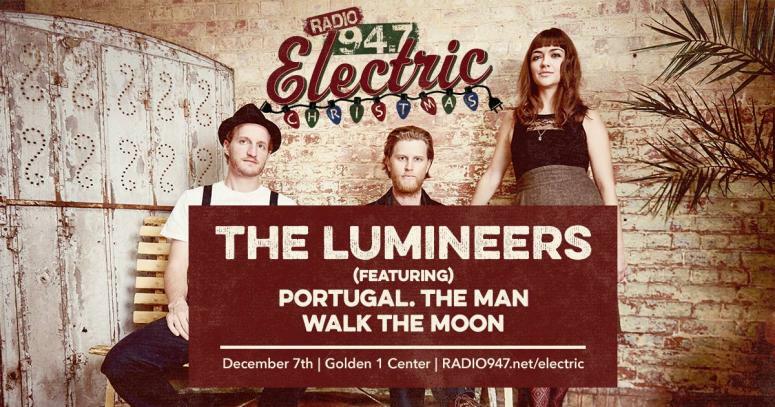 This year’s show features three hit bands: The Lumineers, Portugal. The Man, and Walk The Moon. Ohio indie rock quartet Walk the Moon will be opening the show, at 7 pm. In years past, the shows had more bands playing just a few songs, but in a nod to the popularity of the bands in this year’s lineup, this show will feature longer sets. The next act is Portland, Oregon-based alternative rock band Portugal. The Man, who made the mainstream leap with the infectious “Feel It Still” that is all over radio and TV. Headlining the show is The Lumineers who exploded into the music scene with their global chart-topping song “Ho Hey!” in 2012 have since evolved into one of the top touring acts in the world. This year’s Electric Christmas is presented by Radio 94.7 who also brought the City of Trees festival to the area. Golden 1 Center will host the show and is the first indoor sports arena to be LEED certified platinum in recognition of its efforts to build an energy and resource-efficient building that has also committed to providing visitors with locally sourced, farm to fork food offerings. Electric Christmas is sold out, so find a friend who has an extra ticket or hope for a Christmas miracle. The show starts at 7 pm Thursday, December 7th. Tags: Christmas, City of Trees, Dan Tyree, Electric Christmas, Feel It Still, Golden 1 Center, Hey Ho, Lumineers, Portugal. The Man, Radio 94.7, shows, TUBE. Magazine, Walk The Moon. Bookmark the permalink.